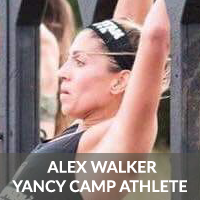 Premier OCR Athlete Alex Walker - Yancy Camp - Fitness for Everyone! Alexandra (Alex) Walker from San Antonio, Texas, has been training with Yancy for over two years and just wrapped a very successful season on the OCR racing circuit. She jumped all over the Spartan race scene this season and posted 4 1st place podium finishes (Houston, Miami, & Austin), a 6th place finish at NBC Spartan Asheville, and an 18th place finish at World Championships in Tahoe, and she also finished 3rd at the USAOCR Championships in Miami. Alex is known for having exceptional obstacle proficiency skills and has been dramatically improving her running game. She's been stepping up to compete against the best competition in the world and her performances show it's right where she belongs.